One can imagine the chorus “How do you solve a problem like Hawkman?” being sung around the DC Comics offices like they’re putting on a Sound of Music revival. Carter Hall, Katar Hal, Fel Ander. 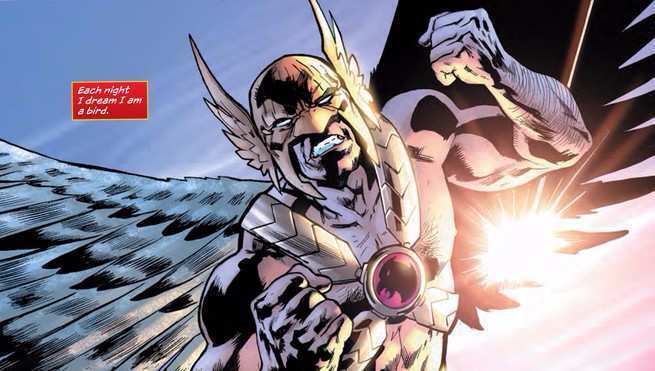 Hawkman has been a force at DC for decades, but time has done the character no favors. His history has only become more twisted with each attempt to unravel it, maintaining a fanbase and attraction in spite of a daunting Wikipedia entry. 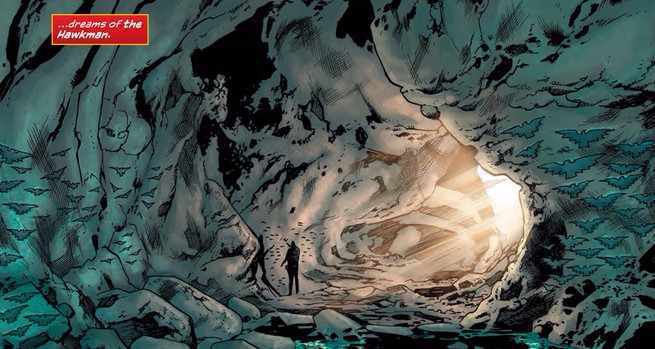 The newest attempt begins in Hawkman Found #1, a Dark Nights: Metal tie-in, and it seems to have found a spark of hope in the cavern of continuity. Above all else, Hawkman Found #1 is a good-looking comic. In Bryan Hitch’s first collaboration with inker Kevin Nowlan, it’s clear that the pairing is an excellent fit. While many of the splash panels and pages provide static postures, there’s fluidity to the inks that lessen the impact and make each big moment feel more like a comic than a poster. There is real movement to be found between panels as Carter forces himself up cliff sides and leaps onto enormous alien ships. Hitch’s storytelling has not been this compelling since he completed work on The Ultimates. Hitch is an excellent match to the subject matter of Hawkman Found based on his own skills. The issue trades in sprawling landscapes, grizzled combatants, and brutal violence. Lemire’s script is as “friendly” as one could imagine and makes the collaboration one that could work well beyond the confines of a single issue. Not only does Hitch’s Hawkman look great when throwing his arms out and soaring over most of one page, but Lemire effectively makes this the essence of who Hawkman is within the story. Rather than attempt to simplify or explain Hawkman, Lemire makes the complexity of his past a feature of this story instead of a bug. Carter Hall is every bit as confused about his position on a desert planet as readers are and hints at larger forces through fading memories. The conflict remains clear and does not require an understanding of continuity. Hall is facing overwhelming odds and a visually compelling enemy, both of which are efficiently established. The story focuses on the why of Hawkman above any other question and finds a compelling hook in doing so. Lemire and Hitch’s Hawkman is about the fight – accomplishing the impossible, pushing one’s own body, and reveling in the journey. This is the thesis Hawkman requires. These efforts are hamstrung at times by the necessities of an event tie-in. Lemire leaps from the small scope of one man’s battle to a multiversal forge and destinies, even though it’s clear this story only flies in the former. Hitch’s bubbling universal cauldron and beastly antagonist make these detours more bearable, but they are ultimately sections that could be clipped out to little effect. As a return to DC Comics, Hawkman Found shows what Lemire brings to the table and why fans ought to be excited. He understands superheroes and works well even within the constraints of an odd event comic like this one. Above all of that his collaboration with Hitch and Nowlan reveals a writer who provides the best possible script for his artist so that they can make it soar. With any luck, some or all of these creators may finally be the ones to solve a problem like Hawkman.